Australian Festival of Music – Vol 10. $6. Vinyl Ex (see below). Sleeve Ex+. The sleeve tells me that in 1972 there was a project to perform and record composers from around Australia. This is one of the fruits thereof. Much talk here nowadays of Australia’s cultural identity. Rather more than just talk in those days, it would seem. Interval Piece: Martin Weasley-Smith. Something to do with intervals. I was unable to identify any patterns. It seemed like a long period of brief musical motifs and moments. Not much in the way of changes in pace or volume. A bit like an attempt to use music to illustrate the experience of moving through a large cloud of insects. Dimensions – Suite for 12 Strings: Janet Dobie. Apparently this obeys some of the rules of serialism. Completely lost on me. “I thought you were all glittering with the noblest of carriage”: George Tibbits. Also completely lost on me. At least the Janet Dobie piece had some technical sleeve notes that I could read and fail to understand. This has an excerpt from the Bible and from Finnegan’s Wake. Chimes, Fractured: Jennifer Fowler. Inspired by being in Liverpool and hearing simultaneously a cathedral organist, bell ringers rehearsing, and bagpipes from a wedding. Not as bad as you might expect. It is not just random sounds. And there is some percussion that helps hold it together. The composer describes it as a fun piece, and there is something in that. However, I don’t know that it works; that is to say that it I doubt that I’ll listen to it again. Water…Footsteps…Time: Barry Conyngham. At 19.5 minutes this is the longest piece on the album. Inspired by a trip to Japan. The notes are a list of 12 gnomic statements that cater to my notion of Japaneseness, closet orientalist that I am (“The sound of water is so soft in Japan”)(“Often the score only suggests.”). The title is from the last of them and also gives you a flavour. What about the music? Well, it is also a bit like that. And I think it is pretty good. If I had heard it on an arty Japanese film from the early 70’s I wouldn’t have questioned its authenticity. My guess is that the original owner of the LP liked it too, because that track is marred by pops and crackles, whereas the others are basically noise free. I expect to listen to Barry a few more times at least. Thanks Funktionnaire, that sounds great! I have heard very little modern Australian classical but at least now I have some names I can chase down. There is another couple of Oz LP's from the small batch of modern classical that I picked up a while back. I'll move them to the top of the pile. I must start thinking about listing things for trade. Currently reading Norman Lebrecht's "Maestros, Masterpieces and Madness - The Secret Life and Shameful Death of the Classical Record Industry" and it's very enjoyable and full of opinionated writing, and behind-the-scenes anecdotes and info about how record companies worked. Some shockingly low (and high) sales figures, crazy contracts, just got up to the CD era, including the desperate attempts of the majors to buy Naxos, including people flying to Hong Kong with suitcases of cash (and Naxos' own classic slightly dodgy budget label behaviour). Really useful also to see how the labels and sublabels fitted together and how they positioned themselves in the market. There's quite a few WTF moments in the writing though, but it's a fun read. The hardback has a nicer but blander cover than the slightly lurid paperback. Just secured a copy of the lurid paperback - looks superb! Thanks for the tip! 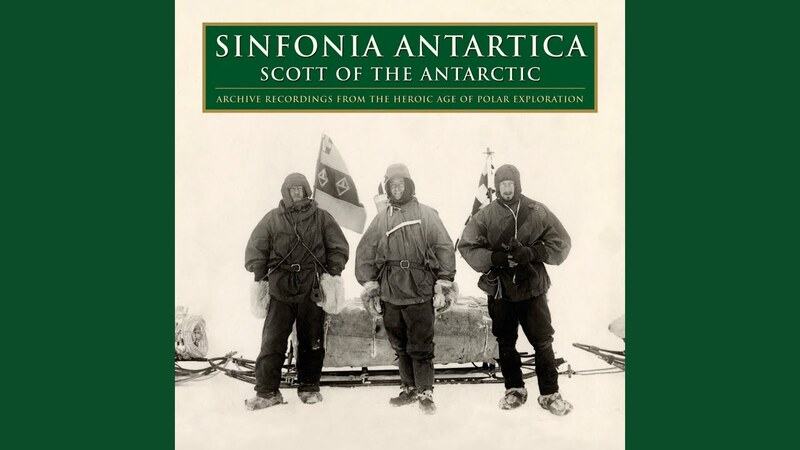 Was out digging earlier today and came across an LP by Ralph Vaughan Williams - 'Sinfonia Antarctica' (or possibly 'Sonata Antarctica'). It was on Decca Ace of Clubs and the cover was a beautiful, simple monochrome print. Is it worthwhile going back for as I'm having digger's regret over leaving it (on account of classical not really being my bag and it not really ticking any of my collector boxes)? Unless anyone knows any technical frailties about the press, go for it. I listened to side 2 of this twice this evening. Two other pieces on side 2. At the same time I read New Scientist. Amazing the progress they are making in training dogs to use their sense of smell to detect disease in humans. New Scientist couldn’t resist the chance to make a joke about ‘dognosis’. So much for side 2. Side 1 also has a Trio or Flute, Oboe and Clarinet by Eric Gross. This made me think of a hypothetical nature documentary on squirrels. The squirrels are doing squirrel things in a tree. Scampering about. Gnawing on nuts. Other stuff. This would be the sort of ‘how quaint’ music that you might hear in the background. I came to scoff at the George Dreyfus Didjeridu piece. But it is good. The wind quintet produces slowly shifting blocks of higher frequency sound. The didjeridu playing is improvised. Earlier the didj is more obviously rhythmic – I found the regularity a useful starting point given that much of my listening is more heavily rhythmic. Later it sounds more extemporised, although it still provides the basic impetus. It takes a received notion of Australian music and uses that received notion to produce something that comes across (to me) as considered and refined. It calls for much more listening. The front cover has a white picture of a guy playing a didj against a black background. Google “Adelaide Wind Quintet” and “didjeridu” and go to ‘images’. It is the first picture you will see. Dibs for an Xmas comp – perhaps along with the Conyngham piece I mentioned above. Perhaps also some cheesy euro-funk for contrast. I'm enjoying your reviews, Funktionnaire - keep 'em coming! I'd have snapped that up in a heartbeat but I'm guessing third stream didg stuff aint that uncommon in OZ. Am liking the sound of it. 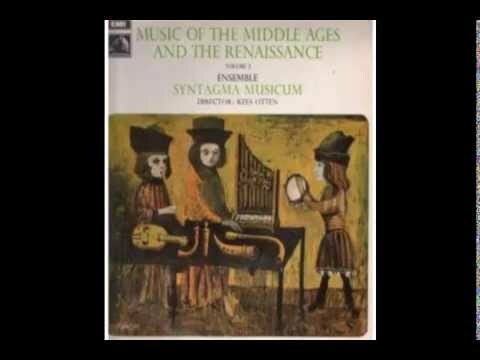 Mines on HMV and actual title is 'Music of the Middle Ages and the Renaissance'. 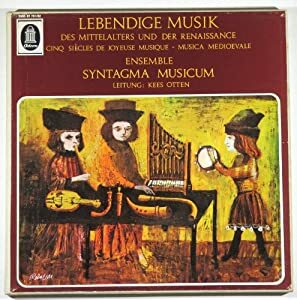 Syntagma Musicum were a dutch early music group led by a virtuoso recorder player who specialised in recreating medieval music using the original instruments so not unlike the work of David Munrow and the early music consort. Sounds almost folky in places. Bit of a bargain at £1. Discogs and eBay copies seem to go for £40 so I'll probably trade it at some point. I love a bit of Krenek- who doesn't.